The bike was well secured with a heavy kryptonite-like heavy chain. It was even tarp covered to protect from the rain. Whoever took it had to have at least 4 ft. bolt cutters, but even with that it would have been a hard job. The person took it in the dead of the night, the night before thanksgiving. It seems pretty calculated. We will take any help we can get. Thank you! I’ll attach a flyer and a few photos. Please feel free to spread the word. If there are other places or people we should contact as well, please let us know. Someone MUST know where it is! It’s a pretty hard bike to hide. Maybe it’s a sign of NYC’s growing bike culture that cargo bikes are now a hot item for thieves. Still, you have to be a special kind of jerk to almost literally steal from a baby. 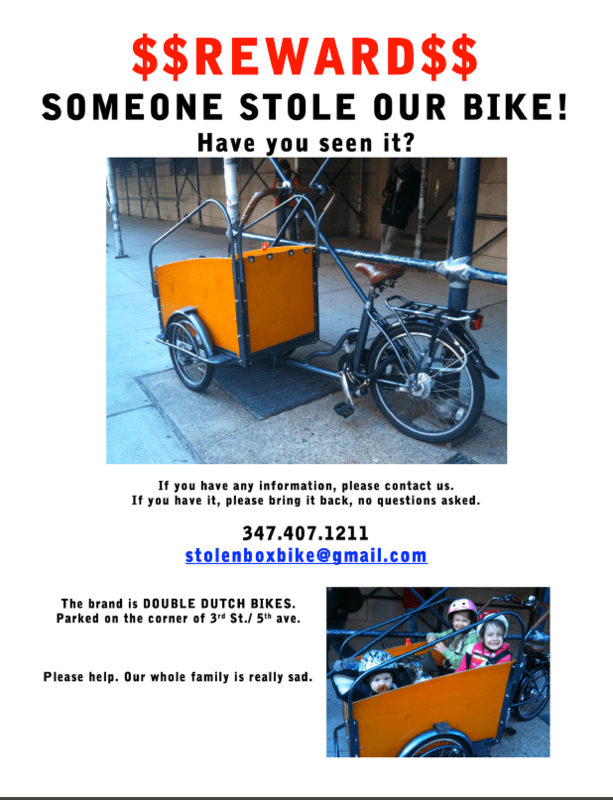 If you happen to see this bike around, email stolenboxbike@gmail.com. Come on, Brooklyn! 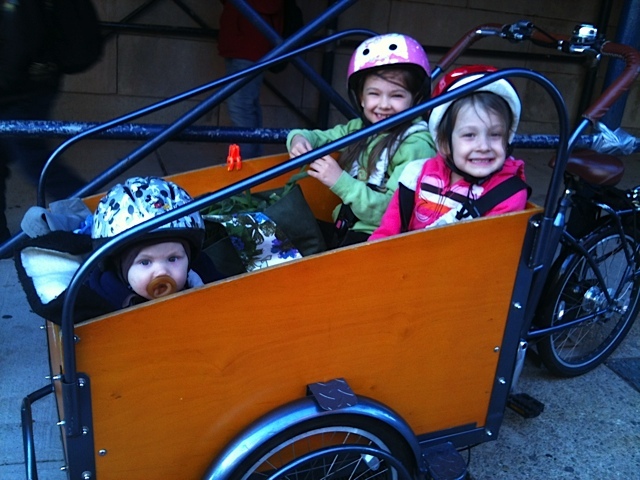 Let’s see if this story can have a Copenhagenize-like ending for this family. I thought you might like to know that this story does indeed have a happy ending: owner and bike are now reunited. I noticed the bike – covered with a tarp – on Cortelyou Road yesterday, and then saw this post today; sure enough, the bike was still there this afternoon. I called the owner, she came down, and she’s now waiting for the police to arrive. It wouldn’t have happened without this blog. The owner asked me to thank you. A Copenhagenize ending! Copenhagenize is soooo happy! Great news! For what it’s worth, local police precincts offer registration and number etching, plus nifty silver anti-theft decals. I got my cargo bikes registered there so in case a similar thing happens, I can prove they belong to me. Ask for the Crime Prevention Officer. Maybe they stole it to get that stupid monstrosity out of the way.